Connacht were facing a fresh injury crisis this week ahead of their return to the Sportsground to take on visitors Newcastle in tomorrow evening's European fixture (7.05pm ). In this first of the back-to-back pre-Christmas fixtures, coach Pat Lam has been left with just 23 players of his European squad fit after last weekend's bonus-point loss to Cardiff in the Pro 12. The backs have been the worst hit - with just 10 expected fit for tomorrow's clash, including Shane O'Leary who has been added to the European squad with long-term injured Nepia Fox Matamua being deregistered. Craig Ronaldson and Kieran Marmion remain doubtful after suffering concussion last weekend, while Bundee Aki and Ian Porter are recovering from ankle injuries. Earlier in the week, fit and ready to go were: Tiernan O'Halloran, Matt Healy, Rory Parata, Peter Robb, Jack Carty, Caolin Blade, Niyi Adeolokun and Danie Poolman, who returned to training this week after a hamstring injury. In the pack No 8 Eoin McKeon is likely to be out for up to a month with a torn elbow ligament, having just returned from a spell on the sidelines, and similarly Quinn Roux, having returned from nose surgery, could now be out for two months with a high ankle rupture. Ben Marshall, having refractured his arm, is sidelined for another three months. "It's lengthy - the injury list- but we just have to try to deal with it," says Lam. However the biggest effect of the injuries is the affect on Connacht's preparations, exacerbated by both John Muldoon (calf ) and Ronan Loughney (back ) being rested earlier in the week. One piece of good news is Andrew Browne's return to training following hand surgery. Thus with stretched resources Connacht seek to preserve their home record against the Falcons and continue their lead in pool one of the Challenge Cup. And Lam knows Newcastle's form in the premiership is no reflection of their talent. "Although they are near the bottom of the table, if you have a look at some of their games, there have been close losses. They have quality players there, they are physical, strong mauling, so it's just going to be another physical battle, back to back. "We have a clear idea of what we need to do. It's just trying to get as much quality into our training this week as we can with the small numbers on the pitch. "The bigger impact is that although some guys might make it back, everything we have done this season is on the back of training, and if we don't have guys available to train, it has a big impact on our preparations." It has necessitated another readjustment in Lam's squad management, particularly with a six-day turnaround following next week's return fixture and a St Stephen's day meeting with Ulster in the Pro 12. "We can't dwell on it, it is what it is. Just look at that list [of injuries]. The damage done is the amount of experience and quality [lost], but that is the reality of rugby and we just adjust, try to get the most of the group this week in training, and it is a mental process. Othr guys have stepped up and now other guys will get an opportunity." Having lost to Cardiff last weekend, Connacht will be keen to return to winning ways as quickly as possible. The injuries against Cardiff affected Connacht's second half, but they still came within a score of winning. However, the defeat, the first in nine matches in both competitions, allowed the Scarlets to leapfrog Connacht into pole position on the Pro 12 table. For two teams that usually slug it out within a score, the clash at Arms Park was no different. On the field of play it was as combative as always and it quickly became apparent Connacht's lofty lead of the Pro 12 was not going to bother a side that has lost only twice at home to its Irish visitors. No surprise then that there was just three between the sides at half time, with Connacht edging the game by 13-10. Within six minutes the Blues were beginning to open up play, utilising their wings to push up field, but it was the pack who did the damage when No 8 Manoa Vosowai scored from a rolling maul and fullback Rhys Patchell added the conversion. Connacht seized the initiative when some superb defence from Tiernan O'Halloran forced a five metre scrum from Patchell's failure to clear, and Connacht capitalised. Initially the Cardiff defence held firm as Eoin McKeon and Bundee Aki went in search of the line, but eventually Aly Muldowney created the opening for Ian Porter who dived over in the left corner. The scrumhalf, having taken over the kicking duties after the early departure of Craig Ronaldson, saw his conversion bounce off the upright. Aki was once again in the thick of the action, forcing a penalty at the breakdown, and this time it was Connacht who drove over, Roux taking the line-out and McKeon touching down. While Patchell slotted a straightforward penalty to level by the 25th minute, from the long restart, Connacht managed to forced Cardiff's Vosowai to concede at the breakdown and Porter added the three-points to keep their noses in front. Connacht continued to maintain the momentum, stretching the Blues from left to right with Healy, McKeon and Muldowney all punching holes in the Blues' defence. 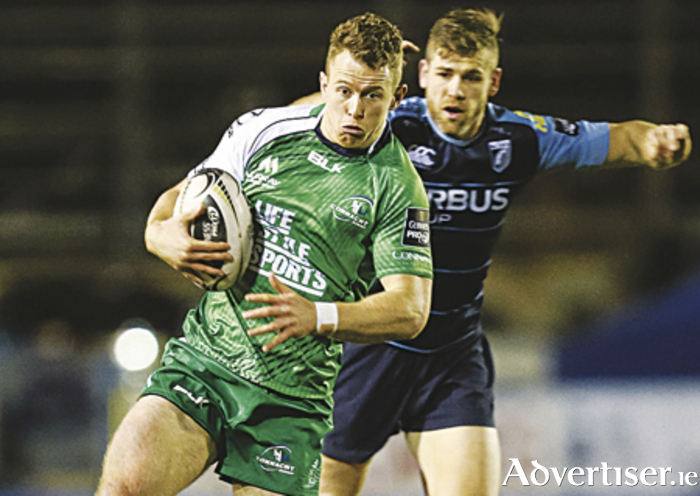 However Connacht were unable to finish a handful of scoring chances. Connacht spent the remainder of the half on attack, running some impressive lines, but it ended with a second Connacht injury when Quinn Roux, just back from nose surgery, was stretchered off. And Connacht's cause was not helped within minutes of the restart when both Porter and replacement scumhalf Kieran Marmion were also substituted for injuries, necessitating a reshuffle of the backline, with Healy moving into the No 9 berth where he played at school. The changes certainly affected Connacht's attacking structure in a scrappy second half, and Lam was left counting the costs of the mounting injuries. A Patchell penalty in the 53rd minute broke the stalematem and when the referee reversed a penalty, Tom James slipped through the cover to touch down, Patchell's conversion putting the Blues into a 17-13 lead after 55 minutes. The leading points scorer continued to add to their tally with a 50m penalty after 64 minutes to extend the Blues' lead to seven. Connacht, having struggled to gain a foothold in second half, regained momentum through Bundee Aki, enabling Jack Carty to post a penalty from the 22 in the 69th minute. It reduced the deficit to four points to set up a tense finish. The New zealand centre did his best to take Connacht over the line, forcing a penalty before a superb break brought Connacht inside the Blues' 22 with six minutes remaining. From a penalty to touch, Connacht looked to have snatched victory, picking and driving over the line, but they could not finish off - the TMO ruling a knock-on. A losing bonus point was some consolation in the circumstances. "I am mighty proud," said Lam. "I don't think many teams would have coped with an adjustment like that and still been in with a chance to win the game. And we did have chances, but ultimately we put ourselves into a bit of a dog fight. "Fair play to Matt [Healy], but certainly for our game and the way we play, it was a big loss to lose first Ian at half time and then Kieran Marmion after just 30 seconds. For us still to be in with a shout of winning the game at the end was a massive massive effort by the boys." Connacht Rugby: T O'Halloran, D Leader, B Aki, C Ronaldson, M Healy, J Carty, I Porter, R Loughney, D Heffernan, R Ah You, Q Roux, A Muldowney, J Muldoon (cpt ), J Connolly, E McKeon. Replacements, P Robb for Ronaldson (8m ), G Naoupu for Roux (38 ), K Marmion for Porter (HT ), R Parata for Marmion (41 ), F Bealham for Ah You (56 ), S O'Brien for McKeon (58 ), C O'Donnell for Loughney (71 ).